Tomorrow I will run the Royal Parks Half Marathon in support of the charity "Combat Stress"
I got involved with Combat Stress after a chance meeting with one of their patrons. I got involved with marathon running by chance too, after moving near to a wide open park in Paris that just seemed made for running. Serendipity. I haven't sent out e-mails seeking sponsorship for this run, I haven't rattled a tin at the local tube station and I haven't set up a JustGiving page (I have done all of those in the past and remain grateful to those who were kind enough to contribute). I appreciate that the financial pressures on everyone are extreme and that many will already have a charity that is near and dear and which they choose to support whenever they can. I will make my own donation to Combat Stress. I have only a little affiliation with the military. Relatives have been involved - one died in the Great War, another flew 'planes from Ark Royal as a Squadron Leader, one was an Air Commodore in the Reserves - but I have no personal experience. That problem is increasingly likely to mature within the next 10 years. There is little data on how troops are affected after encountering combat, the severe injury or death of their comrades and friends, the separation from their own loved ones and the return to "normal life" - a life that is very different from what they have just been through. Some adjust. Some don't. The trouble is that the "don'ts" can take years to show the signs. The most often quoted figures suggest that some 7% of returning soldiers will show the symptoms of PTSD but not until, on average, some 14 years after they have left the army. Combat is more intense and on multiple successive fronts; a relatively small number of people have military experience (when compared with conflicts 50 years ago or more from which most of the data is sourced); information on wins / losses / injuries / deaths circulates far faster (both to the troops and to those at home); and now, troop counts (with troops being "made redundant" - as if - almost upon their return) are reducing increasing the number of former soldiers who will be looking for something else to do. All of these points and a few more led me, after researching the available data, to conclude that there is a problem coming, probably some time in the second term of this government (assuming that they win the next election). Help for Heroes does an amazing job of dealing with the troops that come home injured, Combat Stress deals with those who return home apparently normal but, some time, later are plainly not. There is a bigger category of troops - a General I know calls them "the rest" in a fatherly sort of way - who will never seek help but who end up alcohol or drugs-dependent, in jail, homeless, or beat up people in bars. Not all troops will end up in any of these categories of course, not even a majority. But a substantial enough number will. 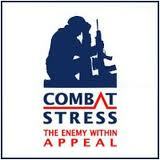 Combat Stress will be there to help as many as they can. And that "as many as they can" is determined, largely, by donations. So I like to raise money and give my time to Combat Stress. If you feel the same, you can donate money right from the Combat Stress website avoiding the commission taken by other sites. You can donate by 'phone, by text, or using an online form.